The 2016 presidential campaign continues to attract strong interest, even as the primary process draws widespread criticism. Most registered voters do not think the presidential primaries have been a good way of determining the best-qualified nominees. This is in line with opinions in recent campaigns, but two decades ago voters had a more positive view of the primary process. 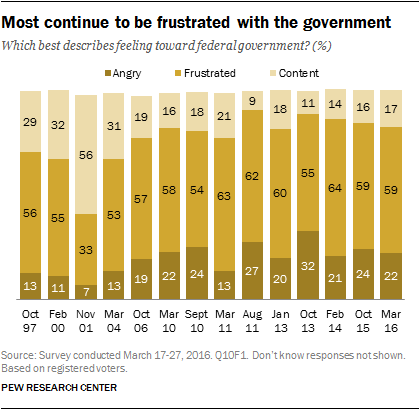 As was seen in a major report on attitudes about government released last fall, voters continue to be more frustrated than angry with government. Frustration – rather than anger – is the dominant emotion in voters’ views of politics as well. That report also found that neither Republicans nor Democrats have a great deal of confidence in the political wisdom of the American people. These sentiments have persisted into the presidential campaign. Views of the nation’s long-term progress – and its future prospects – are deeply divided along racial, age and political lines. More than half of white voters say life for “people like them” has gotten worse over the past half-century, while black and Hispanic voters are more positive in these evaluations. 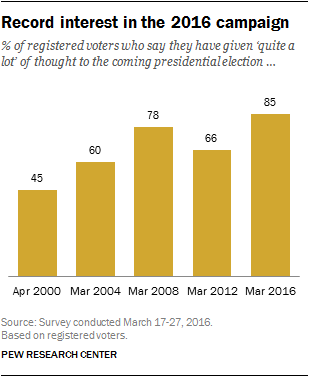 Fully 89% of Republican and Republican-leaning registered voters say they are giving a lot of thought to the election, compared with 82% of Democratic and Democratic-leaning voters. At this stage in the 2012 campaign, when only the GOP had a contested nomination, 71% of Republicans and 64% of Democrats said they were giving a lot of thought to the election. In March 2008, when both parties had nomination fights, 83% of Democrats and 76% of Republicans were giving a great deal of thought to the election. 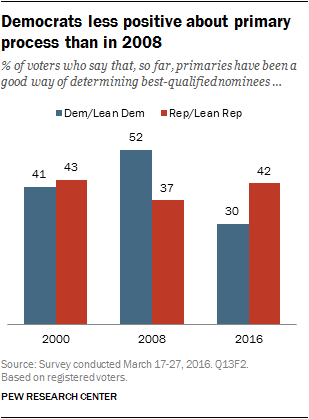 In line with previous Pew Research Center surveys, voters take a dim view of the primary system’s ability to produce well-qualified nominees. 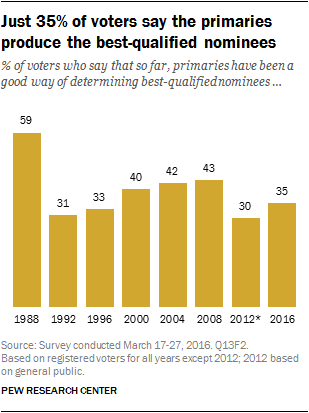 Only 35% of voters say that the primary system is a good way of determining the best qualified nominee. That is a smaller share than in the 2008 campaign, but in line with views of the primary process in 2000 and 1992. Democrats and Republicans differ on whether the presidential primaries are a good way determining the best-qualified nominees. Currently, 42% of Republican voters have a positive view of the primary process, compared with 30% of Democrats. The share of Democrats expressing a positive view of the primary process has declined 22 percentage points (from 52%) in February 2008. Republicans views are little different than in 2000 or 2008. Yet the current partisan differences are largely the result of the highly positive views Trump backers have of the primary process. Six-in-ten GOP voters who support Trump for the Republican nomination say the primaries have been a good way of determining the best-qualified nominees. Majorities of those who support the four other candidates say they have not. Among Republicans, Cruz supporters express more positive views of the primaries than do Kasich backers (40% vs. 17%). Among Democrats, Clinton supporters are more likely than those who support Sanders to say the primaries are a good way of determining the best-qualified nominees (37% vs 25%). In a campaign that has been punctuated by harsh personal attacks, 68% of registered voters say that “personally insulting political opponents is never fair game.” Just 30% say personal attacks are sometimes fair game. There are partisan differences in opinions about of the acceptability of personal insults by politicians. But as with views of the primary process, these differences arise largely from the distinctive views of those who back Trump. Trump supporters are divided: Nearly as many say personal insults are sometimes fair game (47%) as say they are never fair game (51%). Among supporters of the other candidates – Cruz, Kasich, Clinton and Sanders – majorities of between 66% and 74% say that personal insults against political opponents are always off limits. Voters overwhelmingly say that Trump has received too much news coverage. Three-quarters (75%) of all registered voters say that news organizations have given too much coverage to Trump. Views of coverage of most other presidential candidates are much less one-sided. About four-in-ten (41%) say Clinton has received too much coverage, while 48% say news organizations have given about the right amount of coverage to Clinton. 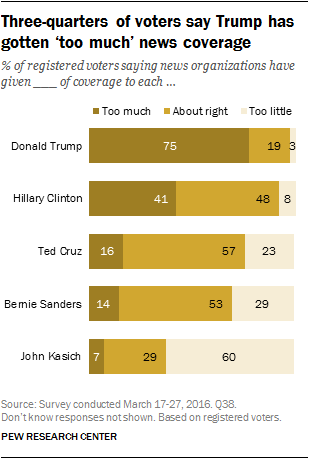 Few voters say Cruz, Sanders or Kasich have received too much coverage. A majority of voters (57%) say Cruz has gotten about the right amount of coverage, and 53% say the same about news coverage of Sanders. Most voters (60%) say news organizations have given too little coverage to Kasich – by far the highest share saying that about coverage of any candidate. Only about half as many voters (29%) say Kasich has received about the right amount of coverage. Perceptions of the amount of coverage each candidate has received vary widely across backers of each of the candidates, although in each case a candidate’s supporters are less likely than those who prefer their rivals to say their candidate receives too much (and more likely to say the candidate receives too little) coverage. Overwhelming majorities of Cruz (84%) and Kasich supporters (90%) think Trump has gotten too much coverage. Most Trump supporters (55%) say he has gotten about the right amount of coverage, although 33% say coverage of their candidate has been excessive. Nearly half of Cruz supporters (47%) think their candidate has gotten about the right amount of coverage, while 43% say he has gotten too little coverage. Majorities of Trump (66%) and Kasich backers (63%) say Cruz has gotten the right amount of news coverage. Roughly eight-in-ten Kasich supporters (82%) say their candidate has gotten too little coverage, a view that is shared by a majority (54%) of Cruz supporters and 42% of Trump backers. Among Democratic voters a majority (66%) also say news organizations have given Kasich too little coverage. Most Democrats (56%) think Cruz has gotten about the right amount of coverage, while Democrats are about as likely as GOP supporters of Kasich and Cruz to say that Trump has gotten too much coverage (88%). Clinton and Sanders supporters also differ in their perceptions of the amount of coverage each candidate receives. Nearly three-quarters of Clinton supporters (73%) say their candidate has gotten the right amount of coverage, while just 12% say Clinton has gotten too much coverage. Among Sanders supporters, about half (51%) think the amount of coverage devoted to Clinton has been appropriate, while 41% say she has gotten too much coverage. A majority of Sanders backers (58%) say the Vermont senator has received too little coverage. Among Clinton supporters, 26% say Sanders has been under-covered, while 64% feel he has received the right amount of coverage. Among Republican voters, 58% say news organizations have given Clinton too much coverage. 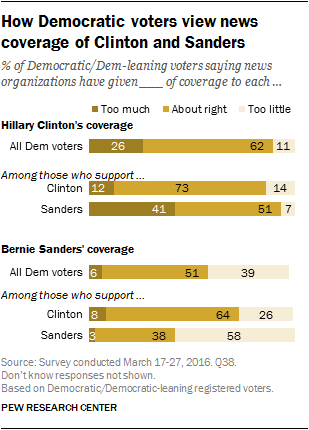 Roughly the same share of GOP voters (55%) say Sanders has gotten about the right amount of news coverage. Voters’ confidence in the political wisdom of the public has changed little since last fall, before the presidential primaries. Just a third of registered voters say they have either a very great deal of confidence or a good deal of confidence in the wisdom of the public when it comes to making political decisions. Nearly two-thirds (65%) say they have little or no confidence in the public’s political wisdom. Since 2007, the shares of both Republicans and Democrats who express at least a good deal of confidence in the public’s political wisdom has fallen sharply. 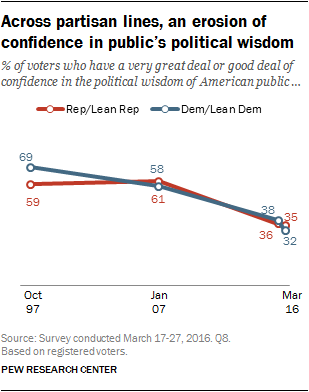 Currently, just 35% of Republican voters and 32% of Democratic voters say they have at least a good deal of confidence in the public’s wisdom in politics, down from 61% and 58%, respectively, nine years ago. Four-in-ten Trump supporters (40%) say they have a very great deal or good deal of confidence in the public’s political wisdom, along with 33% of Cruz backers and 30% of Kasich supporters. Among Democrats, Clinton supporters (36%) are somewhat more likely than Sanders supporters (27%) to express at least a good deal of confidence in the public’s political wisdom. As the primary campaigns continue, overall feelings toward the federal government have remained steady. 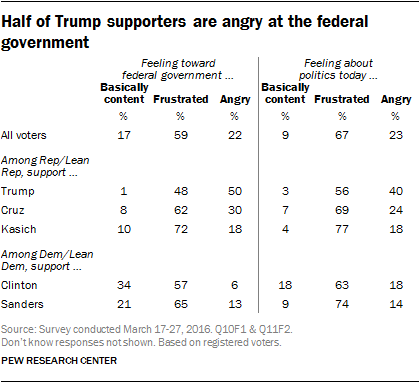 About six-in-ten registered voters (59%) say they feel frustrated with the federal government, while 22% say they are angry and just 17% say they are basically content. Anger toward the federal government is no higher among voters today than it was in October 2015 (24%); and it is lower than in October 2013 (32%), during the 16-day shutdown of the federal government. Republican and Republican-leaning registered voters continue to express higher levels of anger toward than federal government than Democratic and Democratic-leaning registered voters. Overall, 35% of Republican voters say they are angry at government; more (58%) describe themselves as frustrated and just 6% say they are basically content with the federal government. Republican anger toward government is about the same as it was last fall and is slightly lower than it was in October 2013, when it reached a recent high of 41%. 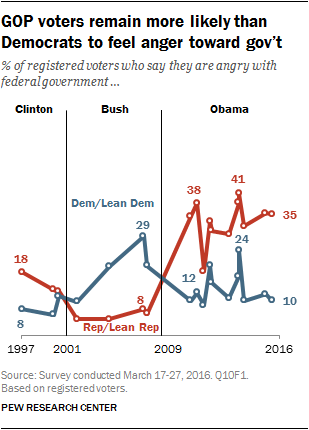 Democratic and Democratic-leaning registered voters express lower levels of anger toward the federal government than Republicans: Just 10% of Democrats say they are angry at government. About six-in-ten Democrats (61%) say they are frustrated with the federal government, while 27% say they are basically content. In recent administrations, members of the party that does not control the White House have consistently express greater levels of anger toward the federal government than members of the president’s party. There are only modest differences between the results of the two questions. 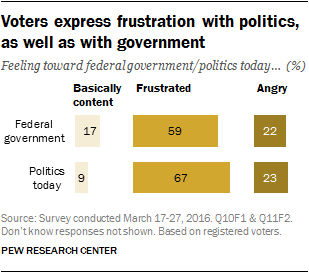 While 59% of voters say they are frustrated with government, 67% express frustration with politics. About one-in-five (22%) express anger at the government, while an almost identical percentage (23%) says they are angry at politics today. Those who express anger at politics were asked in an open-ended format why they are angry. More than half (55%) of voters who are angry about politics cite an aspect of politicians’ conduct as the main reason. 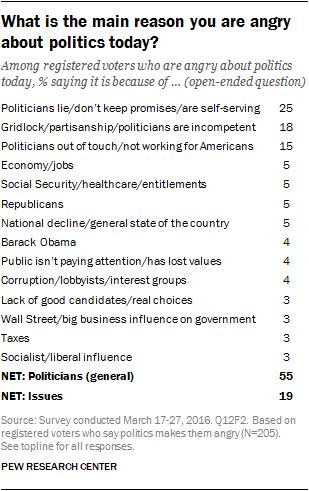 A quarter (25%) specifically mentions dishonest and self-serving politicians as a cause for anger. About one-in-six say they are angry about politicians’ inability to get things done (18%) or mention that politicians are out of touch (15%). Some voters express anger about particular political figures: While 4% point to Barack Obama as the main reason they are angry about politics, roughly the same number (5%) mention Republicans as the reason for their anger. Anger at government – and politics – is much more pronounced among Trump backers than among supporters of any other presidential candidate, Republican or Democrat. Four-in-ten of those who support Trump say they are angry at politics – again, the highest share among supporters of any candidate. Voters are divided in assessing the changes the country has undergone over the past 50 years. While 46% say life in America today is worse for “people like them,” 34% say it is better and 14% say it is about the same. Most white voters (54%) say life in this country has gotten worse for people like them over the past half-century, while most blacks (58%) say life has gotten better. Hispanics express mixed views (41% better, 37% worse, 14% about the same). There also are wide educational differences in these views, with better educated voters more likely to say life in this country for people like them has improved. 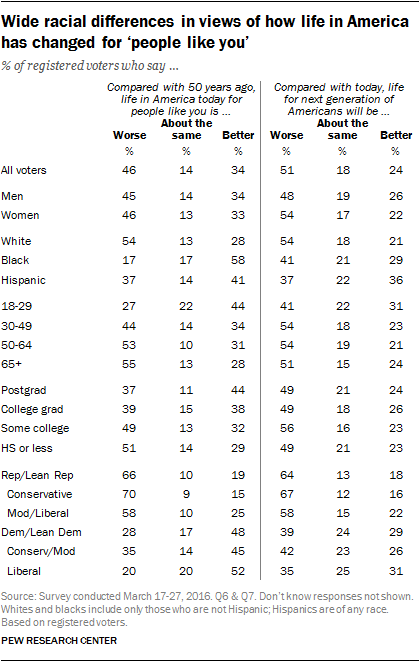 Looking at these differences among white voters, 60% of those who have not completed college say life has gotten worse for people like them, while just 23% say things have gotten better (11% say life is about the same). Among whites with a college degree or more education, 42% say life has gotten worse while nearly as many say it has gotten better (36%) and 15% think it is about the same. Among all registered voters the ideological divide in these opinions is stark: 70% of conservative Republicans think life in the U.S. has gotten worse for people like them, compared with 20% of liberal Democrats. About half of liberal Democrats (52%) say life has gotten better for people like them. When registered voters assess prospects for the next generation of Americans, the outlook is gloomy. About half (51%) say the future for the next generation will be worse, while only about half as many (24%) think life will be better; 18% say life will be about the same as it is today. There are substantial racial, age and partisan gaps in these opinions as well, but the educational differences are far more modest than in views about how life in the U.S. has changed. For instance, 52% of white voters with at least a college degree expect life for the next generation of Americans to be worse, as do 56% of white voters who have not completed college.